Open to race organisers past, present and future! Have the chance to run somewhere new, somewhere in the countryside, somewhere completely different to the race that you do every year just because you feel that you have to. All of our races are unique, they follow a route that will not be repeated year after year. We search Yorkshire's country paths and tracks for the best routes, then write them up into a set of easy to follow instructions to guide you around the course. It's a joy discovering the route as you go, no navigation skills are required other than knowing left from right! There's no pressure with our races, unless of course you want it! You can race hard or just enjoy the event as a pleasant training run. Either way you will enjoy the challenge of making your way around the course under your own guidance. All runs are timed and you can start your run when you want to, run by yourself or in small groups if you want. This leaves you free to appreciate the views in your own space or race it like a time trial. It also means that everyone has to find their way using their own common sense, making the race a level playing field. 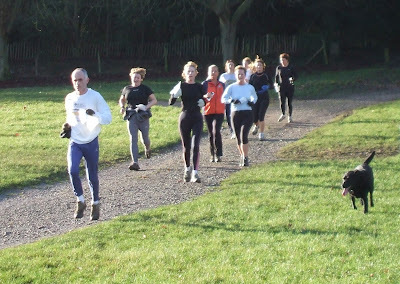 Like to socialise with other runners? How about low cost entry that also includes a voucher towards refreshments in the pub? Interested? Yes? We thought you would be! Read our race guide, and see you at the next race! This kind of trail race is very popular in other parts of England but until recently it wasn't established here in Yorkshire. There are so many good trails in Yorkshire to run on, great pubs to drink in and friendly runners to socialise with. Something had to be done! So Country Trail Races was set up to promote this race format by putting on events and helping others to do the same. We have helped Abbey Runners in Leeds to organise two races which has seen popularity grow. The races are safely organised to the standards set out by organisations like the Trail Running Association. However, the resources needed to hold a country trail race are a fraction of those required for other races, placing the ability to hold a race within the reach of smaller running clubs and keeping costs low for entrants. Contact us if you are interested in these races or want to know more about how you, or your club, can benefit from organising a race of your own. Want another trail race? There will be more next year and possibly in between.... or put a race on! Many different people have so far and it's not hard and an excuse to go trying out pubs isn't it? See race guide for tips on organising a race, or ask us - getting more races for everyone is the whole aim!